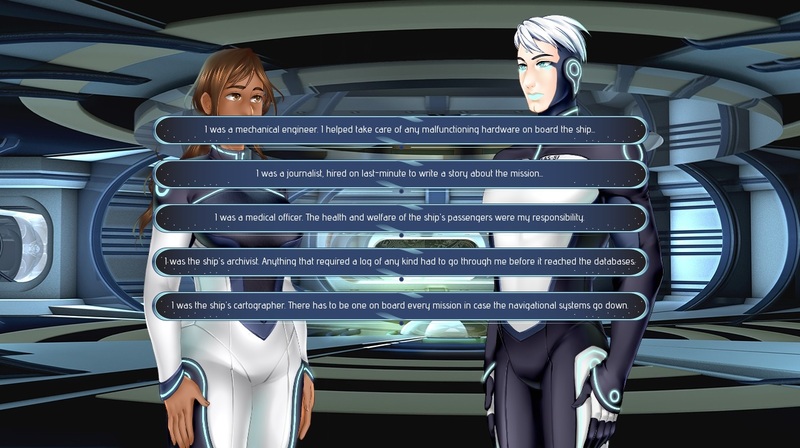 This, My Soul is a scifi-romance VN project for Nanoreno 2017. The story will be linear with heavy amounts of choice, similar to my current on-going project, Queen's Crown. - Three possible endings: Normal end, Friendship end, and Romance end. - A protagonist whose name and personality are determined by you. - A romantic interest who will react differently, and evolve as a character differently, depending on how you treat him. - Original sprites, 3D-rendered backgrounds, GUI, and music! This, My Soul will be rated T for suggestive material. Some parts will get steamy and descriptive, but nothing beyond what you'd find in a PG-13 movie. *NOTE for Mac users! * Some players have experienced issues getting the mac files to work after downloading the 2.0 zip. Because of this, we now have a separate download (1.0 - mac.zip) that should fix the problem. 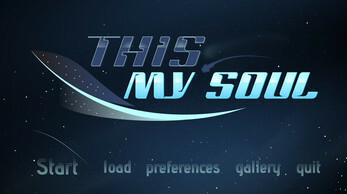 Download the This, My Soul - 2.0 - all.zip file. This is so beautiful and stunning! I got the romance ending and every moment they had was special and so beautiful! Amazing work! Listen, when I tell you I squealed... Consider me an official member of the Silas' protection squad. Oh myyyyyyyyyyyy!!! This game is honestly the most beautiful game I have ever played before in my life! Everything about it is just perfect I can't stop my crying ohmygoodness. I just finished the romantic ending and ughhhhhhhhhh my heart, my soul, everything is crying I just can't Silas...his character as a whole and how the story plays out is so much more awesome than I ever imagined. Also the protagonist is extremely well thought out too, all of it is thought out to the most optimum standard. I've become so attached and now I'm scared to do the other routes...AGHH just the thought of Silas sacrificing himself make me want to cry even more! Throughout the game I became more and more captivated by the story. Especially at the end, jesusweptohmygoodnessholymarysweetmotherofgod the endingggggg every single line was beyond perfect, I can't even express all the emotions I'm currently feeling!!! I'm so happy I found this game, thank you Agashi and team for creating such an enthralling game, I am honestly at a loss for words...thank you, thank you again and again and again!!!!! THERE ARE SPOILERS HERE!! AHhhhHHHH!! XDDD I love this game, and Silas with all my heart!! I've played a couple times, and it gets better every time. I got the romance first, then the normal, then the friendship (I think?) And I will fully admit, I cried. First in the romance when I thought he gave himself up to get her home safely, and that was only a few tears. And THEN, I find out that he really DID give himself up, and then I cried for reals. ANd It huRT. But did I mention that I love Silas with all my heart?? Like, how is it possible to be THIS endearing and cute?? I've always had a weakness for AI's and robots, but this one really hit home. I loved that he was always just "gently" or "slightly" confused, or "politely bewildered", the poor bby. ANd WHen He Said HER ApPEAraNCe waS AlSO PlEasiNg anD ThAT She wAs "Undeniably" SymmETCRICAL aNd HEr EyES WeRe "Exactly" 30 cm ApART. L I K E H E H A D M E A S U R E D IT. O U T O F P U R E (??) C U R I O S I T Y. I swear on Silas's bright blue lips that I rolled from my bed onto the floor, rolled while quietly trying to suppress myself LOUDLY Squealing from joy and enjoying a good 5-minute block of pure fangirling. Complete with pillow screaming, uncontrollable hand motions, and fangasm. There are a lot of smaller things too, that contribute to the overall greatness of it. I went through one route choosing every flirty option. I was NOT DISAPPOINTED. The massage was also the cutest thing asginjsdfkgfs. AND THE WRISTS!! This boi, distracted so easily~ The reoccurring references to them being like teenagers was also a highlight <3 "There is no other way to describe it- he melts at your affection." HNNN("I make you self-conscious? HNNNNNN) Him trying to convey what he's not supposed to feel through eyes that are not meant to see her in that way, the way he waits like a worried puppy at the door during the romance route, like he's afraid you'll be mad so he waits for you to be ready and willing, AND THE KISS. AND THE KISSSSSSSSSSSSSS. THere is MUUUCH to be said on the kiss, but I must say, that both are amazing, I prefer the "MC took the first initiative" one. That was something special. But the engine has TERRIBLE timing. TERRIBLE. I need to stop before I write down the whole story too late, but there are just so many great moments and tiny gems that I cannot get over. And I must confess, I had played Queen's Crown before this one, and after seeing Emry and Noah (For Later), I didn't think this one would be as good. DING DONG I WAS WRONG. I like the setting and art (I like anime more, but I still can never get enough of Everyone's blushies and smiles) more in the Queen's Crown, but the writing, and Silas, takes the cake here. HIS SMILE CHANGES EVERYTHING. But in conclusion, I love everything you've made so far, Agashi. Your two stories are my favorites on here, and some of the only ones so far that I've liked. I look forward to anything else you make, especially if it involves MC and Silas, and hope you know that you are amazing. "I am...defective. And I find myself caring less and less"
*This line still echoes in my head. It is so powerful, and full of meaning and depth, it's the kind of thing that stays with you forever. Thank you again, and kudos to you for changing me and countless others who have loved and enjoyed your game. This is genuinely one of the most touching games I've ever played. The interactions between Silas and the MC are so realistic and at times incredibly moving. Thank you so much for giving myself and others such a wonderful experience with this VN! I can't really think of anything to say that Silvara didn't already, but I can't just not comment. This game illustrates all the things I love about robot/human romance, and it does it SO WELL. Watching Silas grow as an AI, fighting his programming, realizing that he's malfunctioning and making the choice to accept it... it was just so beautiful. First playthrough I was confused as to how he was able to be so unique from other robots, so I played again and am glad there was SOME explanation. It's important to me that when people romance robots, they realize that a normal machine simply wouldn't be able to behave romantically. The thing that makes Silas so wonderful is that he's MORE than the typical LAS-51. I'm still thirsty for background story though; I'd love to know why his creator made him different, and how MC and Silas's relationship would progress once they are reintegrated into society. I got the ending "tears in the rain." It broke my heart. Is there any place I can find a guide for the other endings? Its rare that a game this short can make a person go through a plethora of emotion. Not ashamed to admit I cried at all the endings. Beautiful art and A++ writing. 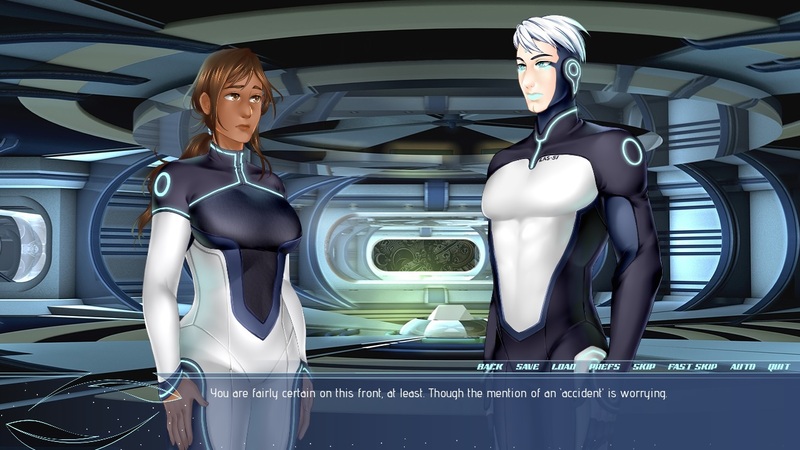 This visual novel may be short, but it's filled to the brim with soul. The sprites are a little stiff, but the CGs are lovely and the writing expressive. Silas has to be one of my favorite characters in any visual novel, and I found myself identifying with him in so many ways; holding back his thoughts and feelings, fighting down any human-like expression. It tore at my heart, and I found myself making sure the MC was as gentle with him as possible. I love "This, My Soul" a great deal. It most certainly deserves more attention and love. Holy crap. Silas is too pure for this world. Where can I get an AI like Silas. My god, this vn succeeded pulled a few heart-string from me even though I'm not crying. Damn, the bundle of cuteness will be the end of me. This game is AMAZING. I am in such an emotional mess right now, I'm on the verge of tears because this game is that damn good. Well done! I absolutely loved the story and how effectively it was told. Usually I get bored whilst playing VN's but I was entertained constantly bc there was never a dull moment, something always felt at stake and I thoroughly enjoyed this mASTERPIECE! I've only done the romance route so far but I'm so happy and satisfied with that ending that I might just replay the same route again. Also, once more congrats on this stellar game!! The friendship and especially the romance however were beautifully written and rewarding. I also loved the romance ending, although it was a little strange for me that Silas and the main character had that whole romantic conversation apparently with the other two rescuers still in the room. I think adding just a few more lines where they are left alone would have made the ending feel smoother. The CGs are also beautiful, and I'd love to tell you my favourite parts but I'd rather not post any spoilers here. I started by playing the romance route and I have to say that I LOVE the interaction you can have with Silas, but not only that. It is very important for me to see the characters personality develop throughout the game, and you delivered. We could see Silas change little by little, and it was very satisfying to see. The story in itself is very interesting, I never thought I could fall in love with a robot, and yet because of your amazing story telling, I did. In my opinion, you are very talented and I really hope to see more games from you! I got this when you first released it and I was blown away. Just finished playing it again and still am blown away by it. The development in this story, my own heart strings were yanked and pulled all over again only this time, I didn't cry like a baby with the "true" ending. Strangely enough, I was more pulled into Silas than the MC, emotionally. I understand how he feels despite his programming and AI. It was like crafting my own emotional issues in the form of an android and I'm still not sure how I'm supposed to feel about it. If anything, I wish I could see how this relationship expands and if Silas learns more about himself, if at all. To see how the MC handles this ever-changing MAN that Silas has become. Overall....I loved it so much, I'd pay you. This game was really well done! While the good ending was really heartwarming, I couldn't help but think of the worst possible outcome. If the company that produced androids found out that an android had overridden their 'human safety protocol', wouldn't that be really bad? The fact that Silas exists means machinery could 'go rogue', so to speak. I mean, in this case the overriding ended well but that'd be a huge liability. Maybe I'm reading too much into it xD I do hope these two have their happy ending, though! Wow. This was an emotional roller coaster from start to finish. I started with the non-romance/non-friendship ending (because I like to do things the wrong way around), and I have to admit that while it was good, it wasn't amazing. Then I worked my way through the friendship and romance paths (in that order) and my mind was totally blown. The complexity of the characters and their relationship was masterful, and I loved how they called into question what humanity really means. During the romance path, when Silas starts talking about how he never had a choice, I swear you could hear my heart breaking. That was a long-winded way of saying that I loved this game and hope to play many more from its creators! I really enjoyed it, but there was one cg in the gallery I did not get but was shown anyway, which felt a little bit spoilery. The bgm was relaxing! 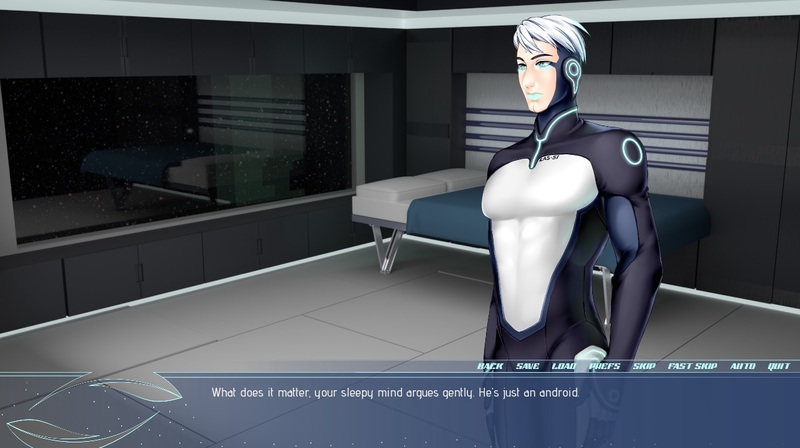 I really liked the attention put into the details and logic of his 'malfunctions' and how he finds ways of reinterpreting protocol to begin to make choices and has mixed feelings about doing so, particularly the argument about her going back to cryo-sleep. That was awesome and so well written and thought out! I think my 'favorite' ending was the sad one, because it had such a bite to it (I got a little choked up), but I'm glad the happy one existed too. God this game played with my heartstrings. I cried after, and I got the happy ending, haha. Please continue to make games, especially if they are like this. I love the kinda constant question of Silas' humanity. It reminds me a bit of a VN that I cant remember the name of that also includes androids learning to love. Its always been an interesting concept to me... What humanity is, and what can have emotion. Anyway, it was an awesome game, thank you so much for sharing it with us. Wow, thanks for the comment Lee. Now I'm maybe curious enough to try it again and maybe try to be a little more ummm "dumb" I guess and be more romantic towards what seems to be a heartless and emotionless robot lol. Anyhow great job, please don't feel discouraged at my initial score because for a free visual novel, it is really good and also really well written. If you have any other VN's you'd like me to look at (even if they cost money), please let me know! I'd love to read more from you, and perhaps will try this one again in the future right here on my channel! I love it that makes me wonder how could you just give it away as a free game (not that I complain though). Thanks so much! i love just everything about this game! The art, the writing, even the fact it made me cry. I'm very glad I got Do Androids Dream before Tears or there would have been even more crying! I delayed writing this, trying to think of like...helpful stuff? Or better phrasing? But you've successfully reduced me to "I love this android" and some intermixed sobbing! Loooool.... That's amazing, thank you! fantastic work, i loved this one! The dialogue from kyndle was loads of fun, and i often had trouble picking what i wanted to say because they were all great options. I got the Do Androids Dream ending first, and it was incredibly heart-wrenching.. or at least, i thought it was, until I got the friendship ending. Had i gotten that ending first, I probably would have burst into tears live on stream. Silas is a really fun character as well, and I loved how he grew over the story! First I got the Tears ending, then finally I managed Android Dream ending. It...was...so...CUTE. flipping loved it, especially the Dream ending, though it took me three tries to find it. Thank you for making this! You're welcome! I'm really glad you liked it enough to try for different endings. ^^ Thanks for taking the time to leave a comment! Ownnn in love with this game (and in love with Silas too <3), I really enjoyed to play and even after one day that I finished to play, still can't get out of my mind! Perfect!! To say that the story stuck with you even after you finished playing it is a wonderful compliment. ^///^ Thank you so much! Haha, thanks for checking it out. ^^ I haven't played that game, actually. I'd never even heard of it tbh, but when I googled, I was pleasantly surprised by all the praise. I may have to check it out later! Ah, I sympathize with you wanting your games all listed neatly in one place (I'm pretty particular about that kind of thing myself), but I can't accept money for this game, unfortunately. Everyone who worked on this game did so for free, and I wouldn't feel right unless we split any revenue/donations equally... And that's just not practical considering the small amount we would get. Splitting 10-20$ a month between 6-7 people for the foreseeable future is just not a good use of my time right now.... :( Sorry. I hope despite this you will enjoy the game anyway! Thanks again! Really, really good! This leaves me wanting more from this author! I want more! Give me! Give me! Give me! I love the story, I love the pacing, and I really love a certain android! Eee! Thank you so much! ^///^ If you haven't already, feel free to check out the demo of my main, flagship title, "Queen's Crown." !!!!!!!!!!!!! I'M IN MY FEELINGS ABOUT THIS GAME! Holy crap, this is (hands down) one of the BEST visual novel games I've played. Wonderfully written, beautifully paced, the art-style is excellent, the MUSIC was stellar -- gah, there's no end to the amount of fantastic things I have to say about this! Huge thanks to everyone involved for making something so great. I also have to say that the characterization was SO GOOOOD. I just really, really enjoyed this.